Johannesburg is a vibrant, bustling city with many students, young people and nationalities from around the world. But it is also a metropole with unfortunately a sticking – unnecessary – negative image. Our “Get-To-Know-JOZI” program is designed for young people; students and volunteers who visit South Africa and Johannesburg for the first time and intend to stay a while for study or work. For many it is a big step to leave the organized Europe or the United States and to move temporary for their internship, study or work to South Africa, Johannesburg. The “Get-To-Know-JOZI” program guides newcomers in this city. 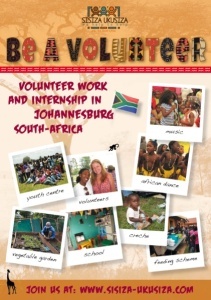 Before the start of your study / internship you stay a week in our VOLUNTEER HOUSE. During that week, we show you around and together we arrange some practicalities (post, ATM and bank, doctor, dentist, requesting cellphone, insurance, public transport or renting / buying a car etc.) We pick you up from the airport and we make sure you know your way around a bit inJohannesburg when you start your study or internship. During this week we will also visit a number of high-profile spots in this vibrant city, so you will get a picture of -how life is- in Johannesburg. After this week you are ready to take on the challenge of your internship, study or job in Jozi. But “Get-To-Know-JOZI” is also available as a friendly back up in case of emergency during your stay in South Africa. You can call us 24/7 when necessary. We appreciate it when you choose Johannesburg as a base to do your internship or study, because we knowJOZI is a great and wonderful city. – Supervision by our own team. – Back up support in South Africa during your internship or study. For this tailor made package, we ask for a financial contribution depending on your personal requirements. Please feel free to contact us. Not just for newcomers it is an exciting time, but also for those left behind at home it is an exciting time. 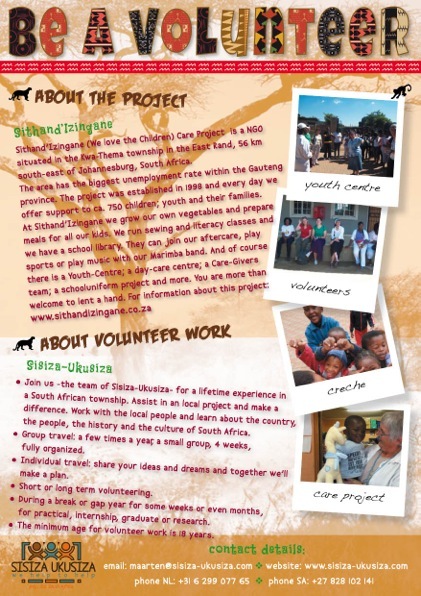 Sisiza-Ukusiza therefore supports both newcomers in our city as well as your family at home. We are there to answer all your questions about your temporary life in Jozi.